Throughout 2012 STC is collaborating with many local and international theatre companies to produce an engaging season of theatre. In this series of profiles, we'll take a look at the inspiring (and often dramatic) evolution of some of these companies and venues. First up is the Traverse Theatre, who have brought us the wonderful Midsummer [a play with songs], currently playing at the Sydney Opera House. The spirit of invention was alive and well among artists living in Edinburgh in the early 1960s, so it seemed natural when an abandoned brothel in Lawnmarket was turned into a tiny theatre space. Using discarded benches from a local cinema for seating, John Calder, Jim Haynes and Richard Demarco banded together to create a theatre company that was charged with the spirit of the Edinburgh Festival, but ran all year around. Terry Lane was appointed the company's first artistic director and, inspired by the seating arrangement, which featured two banks of seating installed on opposite sides of the stage, he named it the Traverse Theatre. It was some time before he realised the correct description for this style of staging is 'transverse', by which time the name had already stuck. The early days at the Traverse were exciting with more than 100 productions opening there in the first three years, including 33 world premieres. The theatre featured a gallery in the early days, which later broke away and became the Richard Demarco Gallery. Actors, writers and directors were drawn to the company, which helped to launch the careers of many. During the 1970s the theatre attracted actors including Bill Nighy, Timothy Dalton, Billy Connelly, Robbie Coltraine, Simon Callow, Bill Patterson and Stephen Berkoff. In the 1980s it was Tilda Swinton, Forbes Masson and Alan Cummings. Writers who have worked with the company include John Byrne, Gregory Burke, David Greig, David Harrower and Liz Lochhead. Like any theatre company, the Traverse has not been immune to a bit of real-life drama, with an actress being accidentally stabbed with a real knife in the company's first year (as they couldn't afford a prop knife), and several threats of police raids due to fears of homosexuality and the possibility of indecency. The Traverse has long since moved on from its humble home in Lawnmarket. Structural concerns forced a shift to a larger and more flexible space in Grassmarket in 1969, a former sailmaker's loft, and the Traverse stayed at this venue until 1992 when it moved to a purpose built, multi-million dollar, two-theatre space in Cambridge Street. 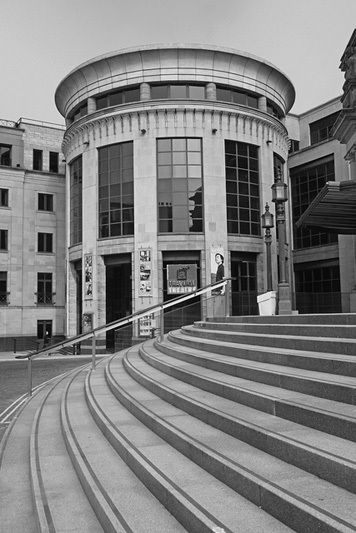 The Traverse has become a particular institution in Edinburgh during festival season, with the theatre hosting 18 shows during the 2010 Edinburgh Fringe Festival. It is also a festive venue in itself, hosting the Manipulate Visual Theatre Festival, the Bank of Scotland Imaginate Festival and its own Autumn Festival. The company has had an extensive youth development program for more than two decades and is particularly focused on encouraging new playwriting from an educational level through to nurturing fledgling and established writers.